Thad Spalding argues in the Texas Supreme Court! - DURHAM, PITTARD & SPALDING L.L.P. Thad Spalding argues in the Texas Supreme Court! 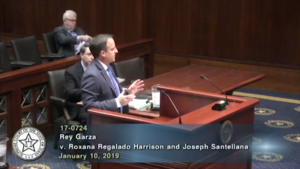 This week, Thad Spalding presented argument in the Texas Supreme Court in Rey Garza v. Roxana Regalado Harrison and Joseph Santellana, individually and as representative of the Estate of Jonathen Anthony Santellana, Deceased, a case involving whether an off-duty police officer, working security for his apartment complex, is immune from suit after shooting and killing Jonathen Sanatellan. Thad’s argument can be seen here.